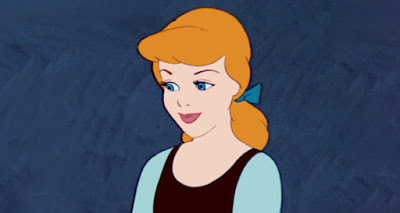 Cinderella lived in a small village in the north of England. She had two sisters; they were very ugly. She got up every morning at six o'clock, then she made breakfast for her sisters, and afterwards she cleaned the house. She worked all day. Her two ugly sisters were very lazy; they never did any work because Cinderella did everything. Cinderella was very unhappy. One day, the postman came to the house. He gave Cinderella's sister an envelope. In the envelope there were three invitations to a party at the Prince's house. She said to her sisters, "Fantastic! There is a party at the Prince's house. I can wear my new red dress and Esmerelda can wear her new blue dress, but Cinderella can't go because her dress is old and dirty and she hasn't got any shoes." On Saturday at 8 o'clock, the ugly sisters went to the party. Cinderella sat in the kitchen. She was very sad. There was a ring at the door. Cinderella opened the door. There was a woman. She said, "Hello! I am your Fairy Godmother. Why are you sad?" Cinderella said, "I want to go to the party but I haven't got any beautiful clothes." The Fairy Godmother said, "No problem, here is a new dress and some glass shoes. There is a golden bicycle in the street. Now you can go to the party, but you must return before 12 o'clock." Cinderella said, "Thank you." She put on the glass shoes and the red dress. She looked very pretty. Then she went to the party by bicycle. The party was very good. At first, Cinderella was very shy but after an hour, the Prince asked Cinderella to dance. They danced for a long time. The Prince said to Cinderella, "I like your dress and you are very pretty." Cinderella was very happy. She forgot what time it was. Suddenly the clock rang. Cinderella said, "Oh no! I must go. It is 12 o'clock." She ran home and at the door of the Prince's house, she lost her shoe. The next day, the Prince was very sad because he was in love with Cinderella but he didn't know where she lived. He went to all the houses in the village and said, "Do you know whose shoe this is?" Finally, he went to Cinderella's house. Cinderella opened the door. The Prince said, "I love you. Do you want to marry me?" Cinderella said, "Yes." The wedding was the week after. Cinderella and the Prince were never unhappy again. When did she get up? How did she go to the party?